How Easy is it to Put a Drive on SCADA? Sometimes it is most convenient to interact with a drive through its physical interface right there on site. Other times it would be much more effective to interact with it using a smart phone, tablet or laptop somewhere away from the well. SCADA is the means to capture and communicate well data to a centrally available system in support of this remote monitoring and control. But how easy is it to put a drive on SCADA? A new drive can come with SCADA already built in, so when the drive is installed on site it is ready to communicate. The pre-installed components include everything needed to connect to your private cellular network. 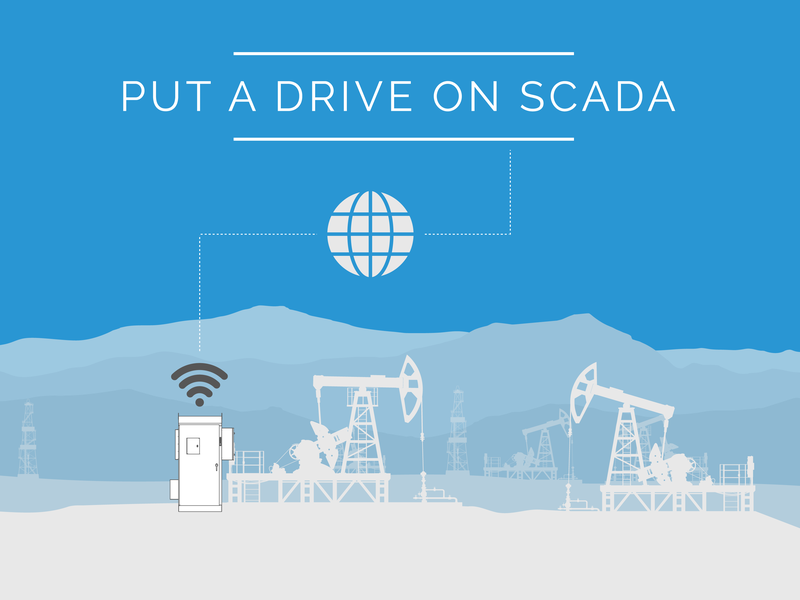 Drives that are already in-service in the field can be easily connected to SCADA. All that is needed is ModBus conformance, a weatherproof communications box and a private cellular network. The communications box connects to your environment and to the cellular network. Read more about this in “Adding SCADA Remote Monitoring to Your Existing Infrastructure”. The data store that receives, stores and makes data available for analysis is typically configured for each operator. Key operator-based data include the specific drive packages and applications in the field and identifiers like logo and colors. Each pump type has specific information that is managed. Pumper notebooks can also be correlated to wells and made digital. During the configuration process, experts can help operators tune their system to be most useful to them. These experts can also assist in troubleshooting oilfield issues as they arise by offering additional ways to analyze and interpret the data. Moving into the digital oilfield presents new analytical and control options that operators may not realize. The experts provide invaluable assistance in helping operators get the most from their system.